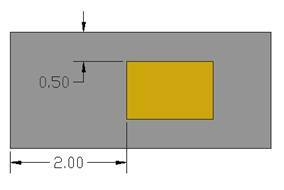 Introduction: In this example you will learn to model a cooling fin for electronics. This involves heat generation, conduction and convection. 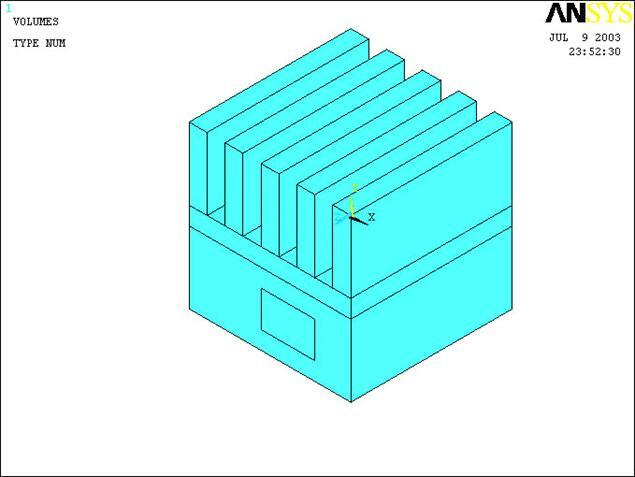 Physical Problem: All electronic components generate heat during the course of their operation. 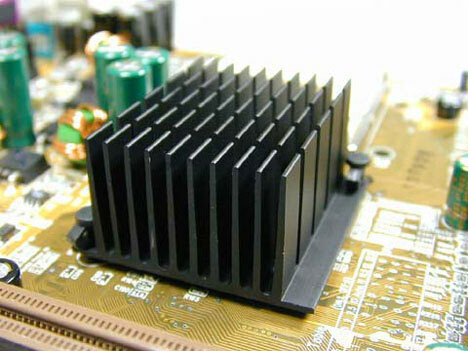 To ensure optimal working of the component, the generated heat needs to be removed and thus the electronic component be cooled. This is done by attaching fins to the device which aid in rapid heat removal to the surroundings. 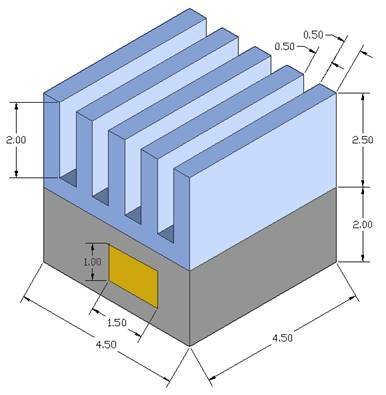 For the sake of simplicity we assume that the electronic circuit is made of copper with thermal conductivity of 386 W/m K. Also it generates heat at the rate of 10e6 W.
The enclosing container is made of steel with thermal conductivity of 20 W/m K.
The fins are made of aluminum with thermal conductivity of 180 W/m K.
Geometry: See figure. Please note that the heat generating copper is only 3 cm long, and does not extend to the end of the base! Boundary conditions: There is convection along all the boundaries except the bottom, which is insulated. The Film Coefficient is 50 W/m2K and the Bulk Temperature is 20oC. To determine the nodal temperature distribution. To determine the maximum value of temperature in the component. Click on ANSYS 6.1in the programs menu. The following menu that comes up. Enter the working directory. All your files will be stored in this directory. Also enter 64 for Total Workspace and 32 for Database. Go to the ANSYS Utility Menu. Check the Cartesian and Grid Only buttons. Enter the values shown in the figure below. Go to the ANSYS Main Menu Preprocessor>Modeling>Create>Volumes>Block>By 2Corners and Z. 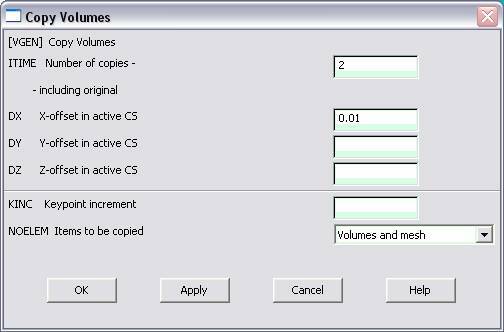 Enter the following data values to create the full steel base of the heat generating volume. 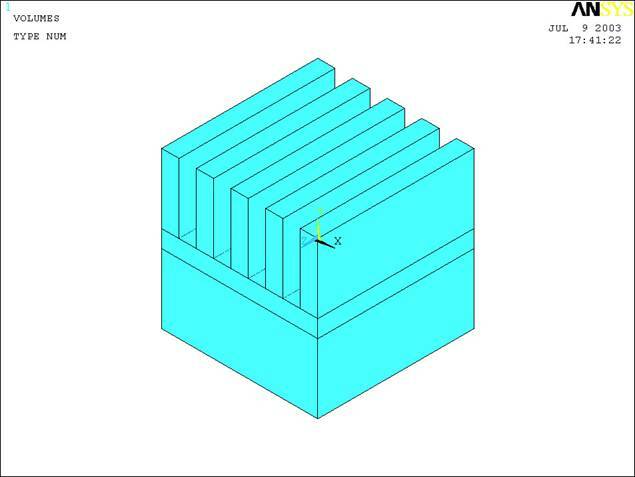 Continue by making the fin assembly in sections, first creating a “base” section and then by making one fin. Now we want to copy the fin volume and paste it offset so that it is correctly positioned along the bottom of the fin assembly. The last step is to use Preprocessor>Modeling>Operate>Booleans>Overlap and select the copper volume and the steel, click OK. The modeling is now finished. The model should look like the one below. We need to define material properties separately for steel, aluminum, and copper. Click Preprocessor>Material Props>Material Models. 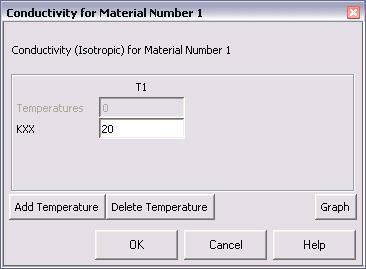 In the window that comes up choose Thermal>Conductivity>Isotropic. Enter 1 for the Material Property Number and click OK. The following window comes up. Fill in 20 for Thermal conductivity. Click OK.
Now the material 1 has the properties defined in the above table. This represents the material properties for steel. Repeat the above steps to create material properties for aluminum (k=180, Material number 2), and copper (k=386, Material number 3). 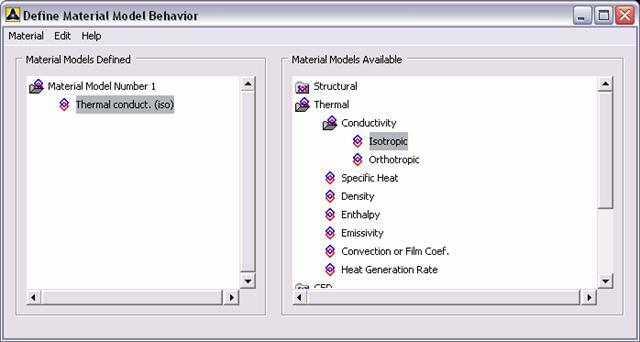 Do this by selecting Material>New Model in the “Define Material Model Behavior” window. 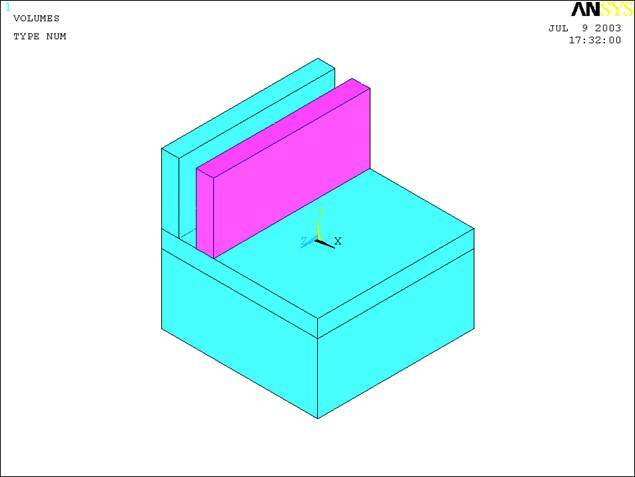 Once finished, exit the material model window. Click Preprocessor>Element Type>Add/Edit/Delete... In the 'Element Types' window that opens click on Add... The following window opens. Type 1 in the Element type reference number. Click on Thermal Mass Solid and select Tet 10node 87. Click OK. Close the 'Element types' window. So now we have selected Element type 1 to be a thermal solid 8node element. The component will now be modeled with thermal solid 8node elements. This finishes the selection of element type. Go to Preprocessor>Meshing>Size Controls>Manual Size>Global>Size. 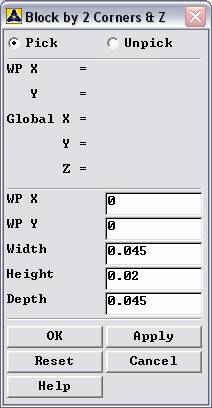 In the menu that comes up type 0.005 in the field for 'Element edge length'. Click on OK. Now when you mesh the figure ANSYS will automatically create meshes that have an edge length of 0.005m along the objects you selected. First we will mesh the steel area. Go to Preprocessor>Meshing>Mesh Attributes>Default Attributes. Make sure the window indicates "Material Ref.#1". The window is shown below. Now go to Preprocessor>Meshing>Mesh>Volumes>Free. Pick the steel area and click OK.
After you mesh the first section, the plot function of ANSYS may only display that meshed solid. To reveal the other solids, use Utility Menu>Plot>Volumes. Even though the already meshed area appears like it did originally, it is STILL meshed! Continue to the next steps. Go to Preprocessor>Loads>Define Loads>Apply>Thermal>Heat Generate>On Areas. Select the areas of the copper square. Click OK. The following window comes up. Enter 1e7 for the HGEN value and click OK.
Go to Preprocessor>Loads>Define Loads>Apply>Thermal>Convection>On Areas. In ISO viewing mode, pick the areas that are clearly visible and don’t try to pick them all (all twenty something areas of the fin assembly) at once. Make notes in a text file if you want to keep track of what you have selected already (such as fins, front, iso or fins, top iso and so on) Click OK. The following window comes up. Just remember that you want to select the aluminum assembly areas, which mean the fins sticking out and the thin bottom of the aluminum assembly. Remember not to pick the bottom side of it too.. because that section is exposed to heat, not convection. Enter 50 for "Film Coefficient" and 20 for "Bulk Temperature" and click OK.
Now the Modeling of the problem is done. Go to ANSYS Main Menu>Solution>Analysis Type>New Analysis. Select Steady State and click on OK.
An error window may appear. Click OK on that window and ignore it. 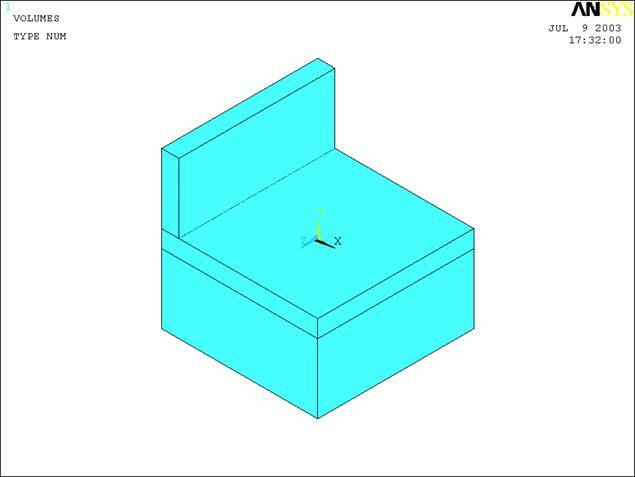 Wait for ANSYS to solve the problem. Click on OK and close the 'Information' window. Go to ANSYS Main Menu General Postprocessing>List Results>Nodal Solution. The following window will come up. Select DOF solution and Temperature. Click on OK. The nodal displacements will be listed as follows. You will find the maximum value of temperature at the end of the above table. You can also plot the displacements and stress.